The dspblok a9248 and dspblok a9238 are the latest additions to Danville Signal Processing dspblok family of DSP modules. 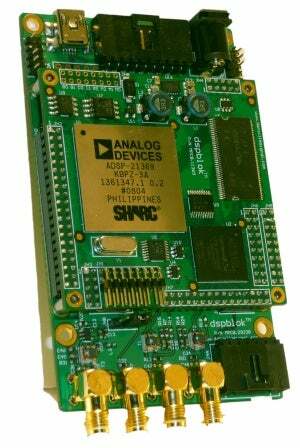 The dspblok a9248 I/O module is a two-channel ADC based on the 14 bit AD9248-65 from analog devices. It has up to a 65M/s sample rate. Since both channels are sampled synchronously, the dspstak a9248 is ideal for direct conversion or IF sampling receiver applications. The dspblok a9248 is powered by Danville’s dspblok 21469, dspblok 21369zx or dspblok 21369+fpga DSP Modules. The dspblok a9248 includes expansion connectors for SPI interfacing, UART, and USB for control and programming. The dspblok a9238 is a similar board running at 12 bits with a 40M/s Sample Rate. Both the dspblok a9248 and a928 are designed to work with the Danville Signal Processing dspblok 21369zx or 21369+fpga DSP modules.